Product prices and availability are accurate as of 2019-04-17 12:05:16 EDT and are subject to change. Any price and availability information displayed on http://www.amazon.com/ at the time of purchase will apply to the purchase of this product. This Paula Deen Signature Garden Rooster Dinnerware Collection combines charm and nostalgia. The unique, hand-painted design complements all kinds of homemade food and drink, from hearty pot pie for the main course to a dish of apple pie with a mug of steaming hot coffee for dessert. 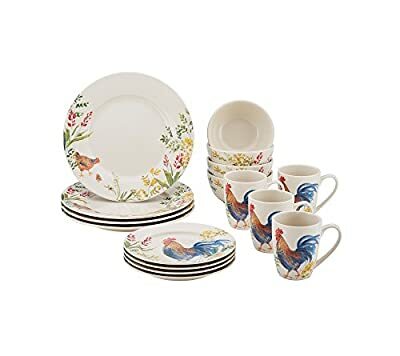 Featured in white multi 16 piece set includes four dinner plates, four salad plates, four cereal bowls and four mugs Dinner plate: 11" Salad plate: 8" Cereal bowl: 5.75"